Apparently Italy is experiencing one of the hottest summers in over two hundred years. This has had an incredible impact on people and the land itself, in particular agriculture. Italians are expecting to have a wheat shortage this year that will cause a rise in the price of pasta, an important Italian staple. In addition, most grape growers are anticipating the harvest by at least a month. This dry hot summer will affect everything from the rate of mortality in Italy’s aging population to the migration patterns of birds. It is incredible the impact weather has on us and how little we can do about it. All of this climate change and extreme weather made me wonder what the impact would be on olives. The last time I talked to Francesco he told me their would be fewer olives this year but that the quality would be very good. Like grapes vines, olive trees focus their attention when they have fewer fruit. This is good news for quality but bad news for quantity. That said, Francesco didn’t seem to concerned about the heat. 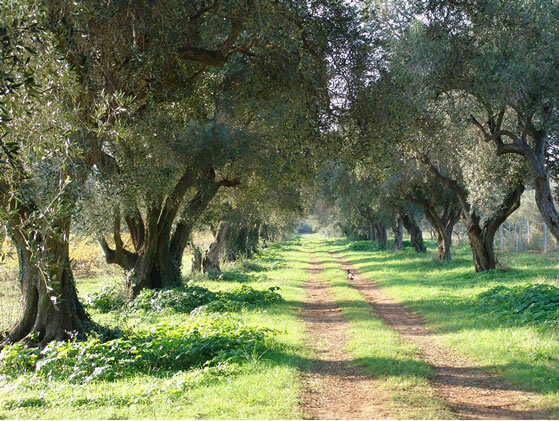 The olives in Amelia aren’t irrigated, like some places, but these trees are some of the most drought resistant plants in the Mediterranean. Their slightly fuzzy silver leaves reflect the sun and provide excellent respiration. While the Italians escape the heat, the olives are basking in the sun. This entry was posted in news on August 7, 2007 by ameliaoil. You may have noticed that we have been working on our new web site. We are slowly getting all of the content up and running. Soon there will be more information on our extra virgin olive oil, our producer, the town of Amelia and how to order our wonderful oil here in North America. Thank you for your patience as we learn and expand. This entry was posted in Blog, news on August 4, 2007 by ameliaoil. I have really enjoyed getting reader comments the past few weeks. I was starting to think I was writing just for my own entertainment. In particular, I have found Henry Mackay’s comments stimulating and well-informed. Mackay is an olive oil producer in Jaen, Spain who writes a very interesting blog called the Olive Oil Gazette. Topics on this blog range from current prices and futures of olive oil to the various awards handed out by international committees. This entry was posted in Farmers, news, origins on June 25, 2007 by ameliaoil. I am very excited about the new tool I discovered (thanks to Sean) for creating mailing lists. If you would like to be kept up to date on special offers and pre-ordering for fresh olive oil from Amelia Oil, fill in your name and e-mail in the form which you’ll see over in the sidebar. I will be adding all our existing clients. There will always be an unsubscribe option on each e-mail. This entry was posted in news on March 18, 2007 by ameliaoil.